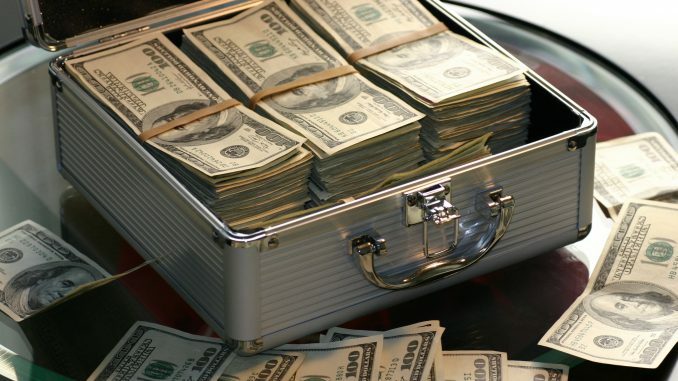 When one is building a portfolio, one of the most important goals is maximizing returns given a specific level of risk (or minimizing the risk given a specific level of return). In theory, there is an ideal portfolio (given the investment policy constraints) which the asset manager should try to follow. If one has a non-efficient portfolio (orange ball), there is an opportunity to increase the return and maintain the level of risk (upper green ball) or to decrease the level of risk maintaining the same level of returns (left green ball). Graph 1. 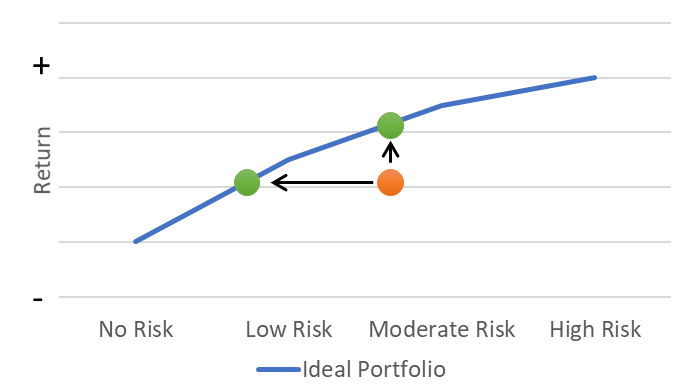 Ideal Portfolio according to levels of risk and return. This efficient allocation is achieved through diversification. Diversification removes specific risks that affect only an industry, company or asset class. For example; if our portfolio has only stocks of ice cream companies, and the industry goes into difficulties because people are switching from ice cream to cakes, we are going to experience some losses. But if our portfolio included stocks from ice cream companies and from cake companies, we could experience fewer losses. In theory, the stocks from the cake companies would increase in value (from the result of more people buying cakes) compensating the decrease in value of the ice cream companies. This movement of one asset (in the example, ice cream companies) with respect to another (cake companies) is called correlation. When building a portfolio, one would try to include assets that are less correlated within each other. Following the premise, if you had a portfolio of Global Stocks diversifying with Emerging Market Stocks and/or US Small Cap companies would not help a lot given their high correlation with Global Stocks (first row). On the contrary, including AAA Bonds will help to diversify because of the low correlation (first row, last column). Table 1: Correlations of three years of yearly returns. But just diversifying the portfolio is enough? No, because as we can see in Graph 2, correlations change over time. Thus, the importance of establishing clear procedures about reviewing and rebalancing the portfolio in the investment policy statements. Correlations change depending on the circumstances. For example, during the dotcom bubble burst, the equity market was affected, but the effect on other markets (i.e. bonds, commodities) was limited. This was translated in low correlations between Global Stocks and other markets. In contrast, during the 2008 recession, not only equities were affected, but also bond markets. This was translated in high correlations between Global Stocks and US Corp. High-Yield (risky bonds) meaning that both markets were moving in almost the same way decreasing the virtues of diversification of a portfolio containing both markets. Not only recessions affect correlations. Other factors such as monetary policies (see the low correlation of EUR 10 Yield since 2016) and economic trends (see high correlations of commodities from 2010 and 2014 when the commodity bubble occurred) affect correlations. The portfolio should be reviewed and, according to specific forecasts, adjusted occasionally to experience the virtues of diversification. Graph 2. Correlations of two years of 5-day returns between Global Stocks and other 4 portfolios. *Source: Bloomberg and own calculations.